With the release of FIDE’s September ratings list we have updated our Current Prodigy Watchlist page. In the past we have simply updated the page and moved on, but this time around we’re going to experiment with a little actual discussion of the changes. Wei Yi continues to maintain a #1 prodigy rank, as the Chinese wunderkind’s rating rose to a new personal record of 2734 this month! He now shows up not only as the highest rated U17 player ever (he is currently just 16.26 years old), but also the second highest rated U18 player ever, tied for being the third highest rated U19 player ever, the fifth highest rated U20 player ever, and even the tenth highest rated U21 player ever! That’s right, he could go almost five years without his rating improving, and STILL be a top ten player of all time, for his age. The kid is good, and his future is bright, is what we’re saying. Of course this probably isn’t news to anyone interested enough in young chess talents to spend their time reading our prodigy update post. Nodirbek Abdusattorov also remains at #1 for his age. Now 10.95 years old and still rated 2432, this Uzbek prodigy hasn’t seen his rating change since the July list, and remains a touch below his lifetime peak of 2465, but has a lot of time to bounce back. Other than Abdusattorov, the youngest age at which any player has ever been rated higher than 2432 is 11.98 years (Sergey Karjakin), so Nodirbeck has a full year in which to improve upon his record without any challengers from history. John M Burke is the most shocking of our three youngsters with #1 ranks. Two months ago on the July rating list he was rated 2258 and had an impressive, but decidedly not historic, prodigy rank of 207, meaning there were 206 players we know of rated higher than him at (or before) the age of 14.01 years. Then the August list was released and he had gained 280 rating points! We added him to our database, and his new 2538 rating was enough to earn him an initial prodigy rank last month of #10. He achieved these games with a 16/25 score in three events, against opponents with an average rating of 2368. This is a performance rating of 2470, so it’s a little odd it was enough to spike his rating to over 2538, but his expected score would have been only 8.75 points in the 25 games, and the 7.25 extra points times a k-factor of 40 got him his gains (note that the games are rated individually, which is why he gained “only” 280 points, not the 290 the above numbers would indicate, but for looking in aggregate at multiple events it’s a good way to estimate rating changes). Full details of his August rating gains can be seen here (login might be required, but it’s a free account to set up). Now this month his rating went up yet again! His rating change in September is due to his 6.5/9 performance at the US Cadet tournament, average opponent 2223. Still not exactly proof of 2600 playing strength, it’s a performance rating of under 2400, but based on when the event was played his rating adjustments were still made based on his old rating of 2258, and so it was enough to earn him 63 more rating points. Burke is now rated 2601 at the age of 14.18 years! He is officially the youngest player ever rated over 2600 (breaking Wei Yi’s previous record of 14.43 years – third fastest was Wesley So who broke the 2600 barrier at 14.99). Going forward, we will see whether Burke is able to justify his record setting ratings. If he continues posting performance ratings in the 2450 range he will start losing rating points, even though over the past two months that was enough for gains. Of course we can expect him to be playing stronger opponents in future events, so we’ll have to see what happens against other GM level opponents (despite the rating Burke himself remains untitled, with no GM norms, and just one IM norm, earned so far.) Burke did beat two GMs on these events (including one rated 2562), so while there’s reason to be skeptical of his rating there are also signs he can play at that level. It will be interesting to watch his upcoming results! Javokhir Sindarov gained 23 rating points with his 8.5/9 performance at the Asian Youth Chess Championships and is now rated 2221 at the tender age of 9.73 years, maintaining his prodigy rank of 3. Vincent Keymer only added 4 rating points, and is now 2356 (just below his peak of 2365). We still don’t know his birthday, so currently have him at 11.67 years old (his maximum age, if born on January 1st), which gives him a prodigy rank of 4, also unchanged from last month. If any readers could track down the German star’s actual birthday for us that would be great! Vladislav Artemiev is, in our view, something of a forgotten prodigy. Overshadowed by Wei Yi, he is over a year older and over 50 points lower rated, so he gets very little credit, but we should remember that Wei Yi’s results are ridiculous and it’s no shame not to match them. Artemiev is the 67th highest rated player in the world at just 17.49 years old! And he just posted a very respectable even score in the extremely strong Russian Superfinal event, bringing his rating to a new peak of 2675. This is the tenth highest rating ever achieved by an U18 player, and of course he still has six more months to improve his standing in that particular measure. Samuel Sevian is the last player on our list with a prodigy rank of 10 or better (a top ten player of all time, for his age). Most recently he performed to expectations in his last event (Washington International) for a small gain of three rating points. He’s now rated 2556 at the age of 14.68 years. Aleksander Tashev of Bulgaria earned almost 100 rating points in four events and now has a prodigy rank of 22, up from a rank of 44 last month, now rated 2048 at an age no higher than 9.66 (another of our unknown birthdays – it’s somewhat reassuring that at least sometimes it can be hard to find the birthday of 10 year old kids online). Volodar Murzin of Russia sits just behind Tashev at 2039, also born in 2006 (birthday also unknown) for a prodigy rank of 23. This is by virtue of a gain of 135 rating points in a month, last month we only had Murzin’s prodigy rank at 60, not enough for inclusion on our published list. M. Amin Tabatabei of Iran is another player we mentioned in our article about the Asian Youth Championships, not because he competed but rather because he skipped that event in favor of the Asian Continental Championship, eschewing youth competition to instead take on the top players on the continent. This effort was rewarded with a small rating gain, followed by larger gains at the U16 Olympiad, where his excellent 9/10 score on board two helped lead his team to overall victory! Ultimately he improved his rating to a personal record 2488 (he is 14.57 years old), and his prodigy rank jumped up to 28, from 48 last month. There were several other players who made big jumps too, but that’s all we’ll highlight for now as this article is pushing over 1200 words. Let us know what other prodigies you would like to see a little blurb about! Prodigies In Action – Asian Youth Championships! Many elite youngsters just finished competing in Korea at the 2015 Asian Youth Chess Championships. Some of the names in action included players we are keeping a close eye on, in our current prodigy watchlist. Since the tournament was divided into age groupings, we’ll take a look at each age category one by one. Any mention we make of ratings will be from the August, 2015, rating list and any ages we mention will be as of August 1st, 2015. Note that players only had to meet the age requirements as of January 1st, so players could be up to eight months older than implied by their age category. Remember also that for many of these young players I don’t know birthdays, just birth years, so must assume they were born on January 1st. These players will be listed in this article as being X.58 years old, but could in actuality be up to a year younger than that if they were born near the end of December (which would greatly improve their listed prodigy ranks). The top two seeds in the U8 division were Borsa Taslimi (Iran, 8.58 years old, 1640 FIDE, #71 prodigy rank) and Bharath Subramaniyam (India, 8.58, 1637, #73). Less than half the players in this section were rated, so these results are volatile, but it’s a fun look into the distant future to see players so extremely young competing. Unfortunately for Taslimi, the highest rated player in this field has far underperformed, scoring just 4.5/9 and shedding over 100 points from his rating. Subramaniyam on the other hand played extremely well, winning the section with a convinving 8/9 score (just two draws). He didn’t clinch victory until the final round, in which he faced (CM Islombeck Sindarov, 8.50, Uzbekistan, 1551, #103 – remember that surname for the under 10 section). Sindarov remained within a point of Subramaniyam in the standings entering their final round contest, but Subramaniyam dispatched him like all the others, to win the event. Despite his excellent performance, chess-results only estimates Subramaniyam to have gained 23 rating points – although I am uncertain how accurate these estimations are in a field with many unrated players. Things heated up in this division with two players from near the top of our prodigy watchlist! CM Javokhir Sindarov (Uzbekistan, 9.65, 2198, #3) and FM R Praggnanandhaa (India, 9.97, 2104, #17) headlined the group (which did still also include 7 unrated players). Praggnanandhaa finished with a disappointing 6/9 score, extending a ratings slide over the last few months. The youngster’s rating originally rose to 2104 last November, then continued to spike to 2203 in February and climbed as high as 2225 by May. An event included in the June rating list, though, cost him 122 of those rating points, and while he then managed to hold steady through his next four events, he appears to have lost an additional 62 points here, and his live rating is now back down to 2042. He has shown enough strong results, and enough ~2200 performance ratings, though, that it would be premature to write him off. There’s a fine chance that he will bounce back soon. Where the two seed struggled, the top seed cruised. In round 8 they faced each other, and Sindarov won the showdown, clinching the championship by building a two point lead with one round left to play. Sindarov ultimately achieved a dominant 8.5/9 score! Of course by rating, this was expected. He lost almost 17 rating points from his one draw, and gained just 23 ELO net in his romp. We may pause, here, to ask a logical question: what does it actually mean for Sindarov to be rated 2221 (live rating) and not yet 10 years old? Is he an inevitable future GM, or is there risk of him peaking before he turns 11 and never really progressing further? Unfortunately I don’t yet have the data I need to answer that. I initially populated my database with players who “succeeded” (all 2700+ players in history, all players who earned the GM title as teenagers), and still need to spend a lot more time searching for players who achieved high ratings at young ages but perhaps didn’t reach the same heights. This means that the data I currently have available will be extremely optimistic in predicting Sindarov’s future, if we compare him to other players who achieved similar ratings at his age. It’s a severe case of confirmation bias. It’s also fun! Pretty good company! 5 of the 13 (ignoring Sindarov and Praggnanandhaa) went on to be 2700+, and several of the others may still get there (Sevian, Dubov, Yifan, and Nyzhnyk are all still young enough that they’re probably strong favorites to eventually exceed 2700, and a few others could get there as well). Abasov and Sevian are the only two not to at least reach 2600 yet, and Sevian at least is clearly still rapidly improving and should get there (and beyond) soon! Does this mean Sindarov is a lock? Well, nothing is guaranteed of course. There is also the case of Kumar Gaurav. In October, 2008, his rating reached 2080 (tied for the 22nd highest U10 rating I am aware of – and the second highest U9 rating I know of). He played 13 more rated games in 2008, his rating fell slightly to 2056, and he hasn’t played a FIDE rated chess game since. That’s the highest U10 rating I’ve found so far that didn’t pan out. However Sindarov is already over 100 points higher than Gaurav’s peak, and probably more importantly has demonstrated much more activity: he has now played 150 rated games, including this current event. 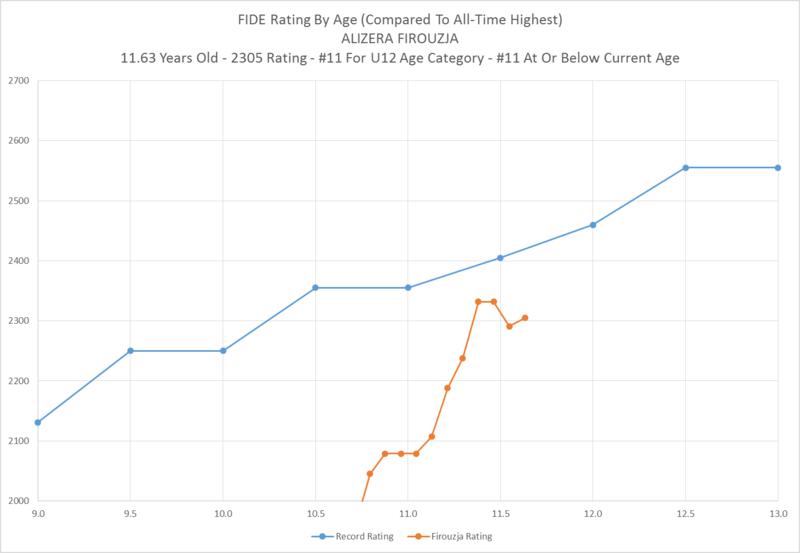 Again, I don’t yet have the data I would need to predict a given prodigy’s odds of continuing to progress versus stagnating, but my instincts are that Sidnarov is in as good a position as anyone under the age of 10 can be for future success. The highest rated player in this group was one we’ve written about before, Alireza Firouzja (Iran, 12.12, 2309, #22). The top prodigy in the section, though, was the #2 seed who also happens to be over a full year younger: CM Nihal Sarin (India, 11.05, 2259, #10). Just like in the U10 division, the Indian youth seeded second in the section struggled while the top seed lived up to his hype and won the section. Sarin drew too many games, plus lost his showdown with Firouzja, and scored just 6/9, tying for fourth place and losing 51 rating points. Firouzja, on the other hand, allowed his opponents just two draws, winning the section with a strong 8/9 result, and adding 14 more rating points to his name (despite no longer benefiting from the high K factor afforded to juniors rated under 2300, after popping back over that threshold last month). 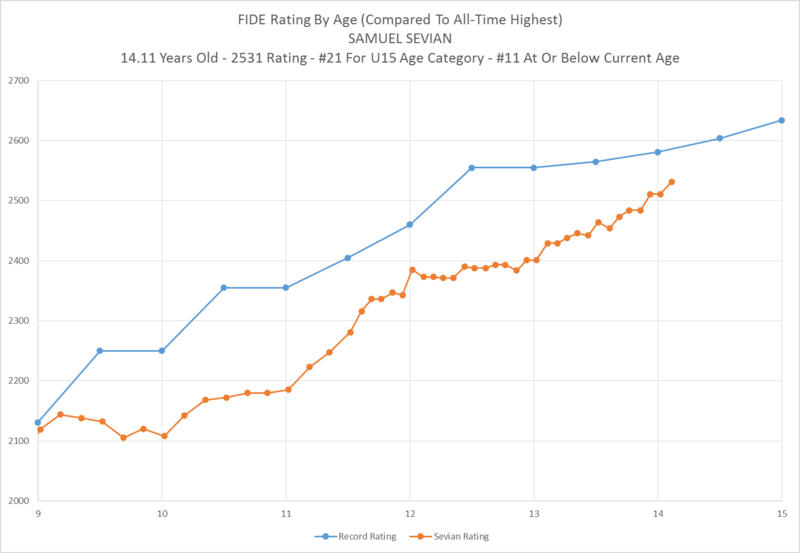 Now at a live rating of 2323, Firouzja still hasn’t quite gotten back to his peak, but is knocking on the door and is currently the 4th highest rated player in the world under the age of 13. The prodigy rank values weren’t quite as high in this section, but we would be remiss if we didn’t at least mention FM Aryan Gholami (Iran, 14.02, 2392, #68). He entered this event as the top seed in his section, scored 7.5/9 with no losses, and won the section. His rating gain of 13 points will bring his live rating above the 2400 mark. He may not quite be setting historical records for his age, but he’s definitely an elite youngster worth paying close attention to! This group included as its top seed the only Grandmaster in the competition. GM Aravindh Chithambaram (India, 15.89, 2505, #54) started atop the table. He lost to a 2134 rated FM in the first round, though, and never really recovered, losing twice more and finishing with a score of just 5/9 – tied for 8th place. Instead, the section was won by the #2 seed: IM Shahin Lorparizangeneh (Iran, 16.54, 2427, #194). I will admit, Lorparizangeneh was not in our database before this event; we had to add him to calculate the prodigy rank. And admittedly, it’s less impressive than some others who we’ve discussed so far. That said, he scored 7/9, including a win over GM Chithambaram, and added 10 points to his rating, while emerging victorious from the section. This certainly deserves mention and kudos! Finally I also want to highlight two other Iranian youngsters who certainly would have had a place at this event, but had a good reason for not attending. Parham Maghsoodloo (Iran, 14.97, 2416, #107) and IM M.Amin Tabatabei (Iran, 14.48, 2458, #46) are both instead competing at the Asian Continental Championships! This is an elite event, with 36 GMs in the field, including top seed Le Quang Liem. So how are the teenagers faring? With one round left to play, both boast 5/8 scores and are among the large group tied for 11th place! Both have defeated two GM opponents, and both have gained rating points. They each get a shot at a potential third GM scalp in the final round, as they seek to finish off their impressive results. I would say they made a good choice in skipping the youth event! UPDATE: Parham Maghsodloo won his 9th round game, giving him three straight victories over GM opponents in the final three rounds. With the win, the untitled underdog who celebrates his 15th birthday in three days, finished with a 6/9 score and tied for sixth place overall! That’s the same result (and with better tie-breaks) as Le Quang Liem! The result earns Maghsoodloo 25 rating points, and while I haven’t verified it yet, I believe should also earn him his first GM norm. Far more important than either of those things: it also earns him a spot in the upcoming World Cup! Congratulations to the young man! Yesterday IM David Martinez published an excellent article on chess24.com, pondering whether or not Wei Yi should be considered to be “ahead of Magnus Carlsen at the same age”. I started to respond with my thoughts in that article’s comments section, but when I reached the character limit I realized it should be a blog post instead. Ultimately, in my view, the question of whether Wei Yi or Magnus Carlsen proves to be the more impressive prodigy will come down not to anything that has happened yet, but to the coming year. 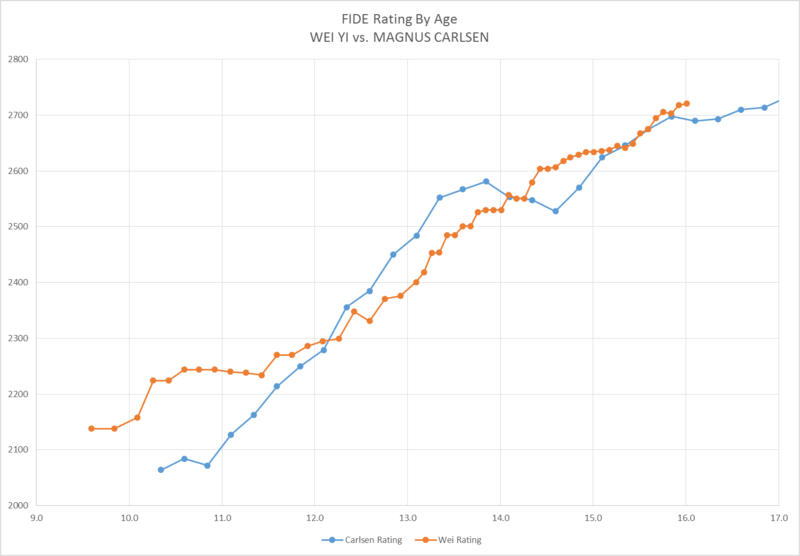 Wei just had a published rating of 2721, a day before his 16th birthday, while Carlsen had his 2698 rating 56 days before his own 16th birthday (although he dropped to 2690 on the first list published after he turned 16). However it’s worth noting that Carlsen had a bit of a mini-plateau around the 2700 mark. After hitting 2698 in October 2006, he didn’t break 2700 until July 2007, and in October 2007 he was still “only” 2714. Now let’s not get carried away with somehow pretending 2714 isn’t insanely impressive. It was good enough for him to be ranked 16th in the world, and remember he was still 16 years old at the time. That said, he was 10 months older when that rating was published than Wei Yi is now, and Wei is already rated higher! Now if Wei Yi has a mini-plateau of his own, and 10 months from now his rating remains in the range of ~2720, then he and Magnus will remain neck and neck. In that case, the argument can continue with no clear winner (which is fine – Magnus doesn’t need to forever remain the “greatest prodigy ever”, as he has moved on and is now working on building a case for the more important unofficial title of “greatest world champion ever”). On the other hand, if Wei Yi wants to cement himself as the top prodigy of all time, this is his chance. If by the time he’s 17 he has achieved significant additional rating gains and finally managed to put some separation between his graph and Carlsen’s then the crown could be his. A good mark might be cracking the top 15 in the world (which would probably require a rating somewhere in the 2750 range), as this would greatly weaken the ratings inflation argument. If 10 months from now Wei were not only rated 35 points higher than Magnus was at the same age, but was also ranked higher than Magnus’ #16 ranking from October 2007, then things would be pretty clear in my view. And as we discussed last time I posted about Wei Yi: there is reason to suspect that he has in fact not plateaued yet, so rating gains over the coming 10 months may be likely. Since that article went up, all he’s done is won his first national championship. In May he defeated five of his countrymen, including most notably a win over Ding Liren, en route to a clean victory in the tournament. A loss in the final game put a small damper on the statistical side of things, costing six rating points and leaving his tournament performance rating at “only” 2730, but that doesn’t reduce the brilliance of the result for the then-15-year-old. So when will Wei Yi and Magnus Carlsen get a chance to “settle” this over the board? Of course one game won’t actually settle anything, statistically speaking, a long match would be much better, but let’s not be greedy! We’ll take a game whenever it comes up! As it so happens, it seems extremely likely that the two will play at least one game at classical time controls before our 10 month window is complete. After crushing the Challengers section at Tata Steel, Wei Yi has earned an invitation to play in the Masters section next January. Presumably we should see Magnus playing that supertournament as well, to defend his title. It’s a long way off, and right now I’m more focused on seeing how Wei Yi performs at the World Cup this fall, or in any other major tournament he may play in that hasn’t been announced yet, but fast forwarding seven months it appears that we should get our showdown. How patient are you? We have been postponing writing a proper “Prodigy Profile” on Wei Yi, simply because there is so much we’d like to say that the project is too daunting! The Chinese super-prodigy has been shattering ratings records (relative to age) for a solid year and a half, and has been on our radar as a remarkable young talent for far longer than that. We still don’t feel ready to post anything final, but as we’ve been working on the project we’ve come across a few bits and pieces we just can’t wait to share. So the point is that he’s pretty good at this whole “chess” thing, especially for his age. In January 2015 he had perhaps his most impressive tournament performance yet, when he won first place in the Challengers division at Tata Steel (scoring 10.5/13, for a 2793 performance rating), unless you prefer his results in April 2015 at the World Team Championships where he scored 7/9 to help China win first place overall, for a 2837 performance rating. 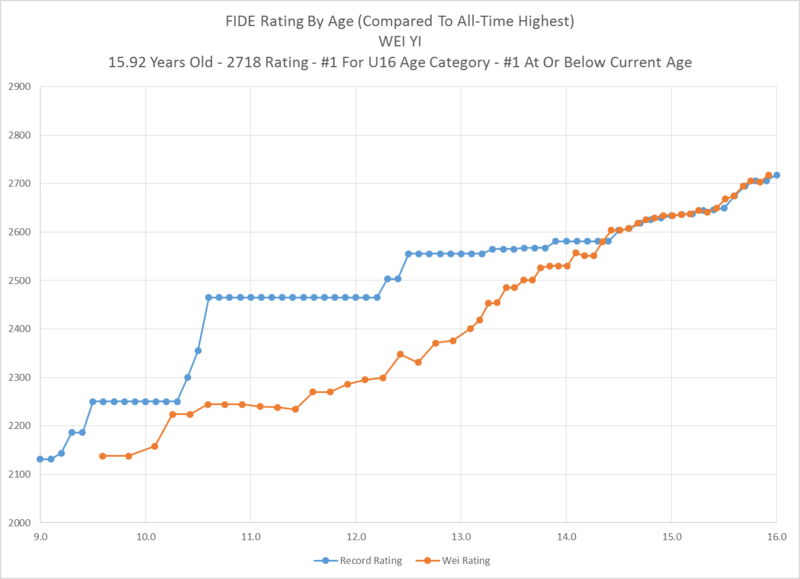 We can see from the graph above that for the last year and a half Wei Yi has been setting a new record for “highest rating ever achieved at age X” with each new published rating. He is now ranked 33rd in the world at 2718. And just in case you didn’t hear it clearly the first time, he is NOT YET 16 YEARS OLD! The obvious question to ask is: how good will he get? Many of the records he is breaking formerly belonged to one Magnus Carlsen, who you may have heard of. As impressive as Wei’s rise has been so far, it’s probably premature to anoint him as the definitive successor to Carlsen’s perch atop the chess world. Still, it is of course intriguing to speculate about his future. We can’t say exactly how strong he will eventually become, or how long it will take for him to climb into the top ten in the world rankings (which isn’t guaranteed… but kind of seems inevitable.) One thing we can clearly say, though, when we look closely at his results to date, is that he doesn’t appear to be approaching any kind of ratings plateau yet. We can notice, first, that in 16 of the 21 events his performance rating exceeded his actual rating at the time. This shouldn’t come as a surprise, of course. One doesn’t gain 111 rating points without a stat like that. More interesting, however, is the trend of his performance ratings. Six of his first seven tournaments in this sample, were in the 2560 to 2650 range. This alone was enough to bring his rating up from 2607 to 2638, but just as his rating started to catch up with his apparent skill level… the performances began to improve. Since July 1, 2014, Wei has played 14 events, and only once posted a performance rating lower than 2670! 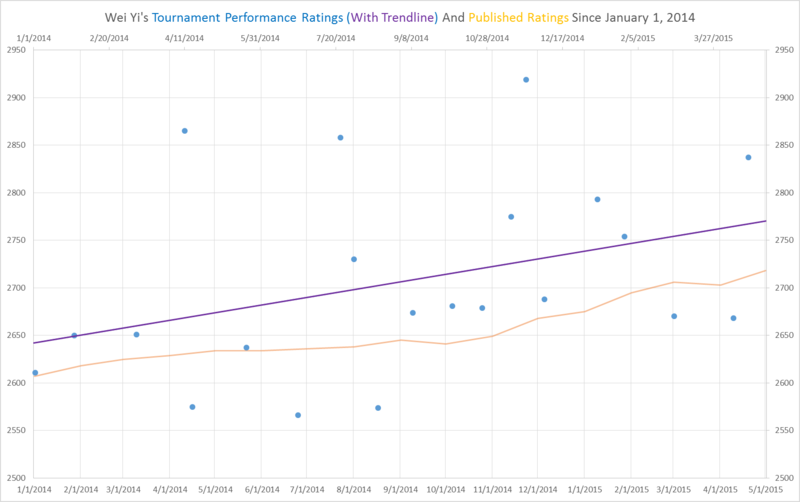 Those 14 tournaments (104 games in all) have been played at a net performance rating of 2745! The obvious conclusion is that even at 2718, Wei Yi’s rating has almost certainly not yet caught up with his “true” playing strength. He has consistently been playing at higher than a 2718 level. And perhaps even more importantly, his apparent “playing strength” has been increasing even faster than his published ratings, so there is no reason to expect his ascent to slow any time soon. It would be fair to expect his rating to climb at least into the 2740+ range before he’d be in any danger of plateauing, just based on the playing strength he has already demonstrated. And if his history is any sign, by the time his rating reaches that new height he may have grown even stronger!